The silicon chip may soon join the growing list of devices to go wireless, a development that could speed computers and lead to a new breed of useful products. A team of researchers headed by a University of Florida electrical engineer has demonstrated the first wireless communication system built entirely on a computer chip. Composed of a miniature radio transmitter and antenna, the tiny system broadcasts information across a fingernail-sized chip, according to an article this month in the Journal of Solid State Circuits published by the Institute of Electrical and Electronics Engineers. The major sponsor of O’s five-year research project is the Semiconductor Research Corp., an industry consortium that has provided about $1 million for the research. As chips increase in size and complexity, transmitting information to all parts of the chip simultaneously through the many tiny wires embedded in the silicon platform becomes more difficult, O said. Chip-based wireless radios could bypass these wires, ensuring continued performance improvements in the larger chips. These tiny radios-on-a-chip also could make possible tiny, inexpensive microphones, motion detectors and other devices, O said. The fastest chips on the market, used in the Pentium 4 and other high-end processors — now operate at a speed of 2 gigahertz, meaning they perform 2 billion calculations per second, O said. Manufacturers are rapidly developing techniques to raise the speed, with chips that process information as fast as 20 gigahertz, or 20 billion calculations per second, already achieved on an experimental basis, he said. Many experts believe even 100-gigahertz chips are feasible. The increase in speed will be accompanied by an increase in chip size, O said. While today’s average chip is about 1 square centimeter, or slightly under half an inch, the faster chips anticipated in the next two decades are expected to be as large as 2 or 3 centimeters, or about 1.2 inches, on each side, he said. 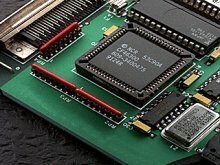 The larger the chip, the harder it is to send information to all of its regions simultaneously because the distances between the millions of tiny circuits within the chip become more varied, O said. This can impact the chip’s performance when the delay affects distribution of the so-called “clock signal,” a basic signal that synchronizes the many different information-processing tasks assigned to the chip. For optimum performance, this signal must reach all regions of the chip at essentially the same time. In the May article, O and his colleagues report broadcasting the clock signal from a tiny transmitter on one side of a chip a distance of 5.6 millimeters, or about a fifth of an inch, across the chip to a tiny receiver at the other end, avoiding all wires within the chip itself. “Instead of running the signal through the wires, what we did was broadcast and receive the signal,” O said. The demonstration proved it is possible to use a wireless system to broadcast on-chip signals, he said. The potential applications for chip-based radios go beyond maintaining the performance of larger chips, O said. In general, the availability of such chips could lead to a chip-to-chip wireless communication infrastructure, seamlessly and constantly connecting desktops, handheld computers, mobile phones and other portable devices. In other potential applications, the military has expressed interest in pairing wireless chips with tiny sensors such as microphones. The idea is to drop thousands or even hundreds of thousands of these devices in a region to eavesdrop over a wide area. The chips would form a listening network by themselves, and the military monitor the system as needed, O said. On the civilian side, O said, scientists and engineers have theorized the wireless chips could be paired with motion detectors and implanted in the walls of buildings. If a building collapsed due to an earthquake, for instance, the network of chips could broadcast information about movement to rescuers in search of victims.